Seachem teases new aquvitro® aquarium tools. NEW PRODUCT ALERT! Introducing aquvitro® aquarium tools—set to hit the shelves of your local fish store soon. The aquavitro® tools are made from premium stainless steel and are ideal for use in both freshwater and marine aquariums. 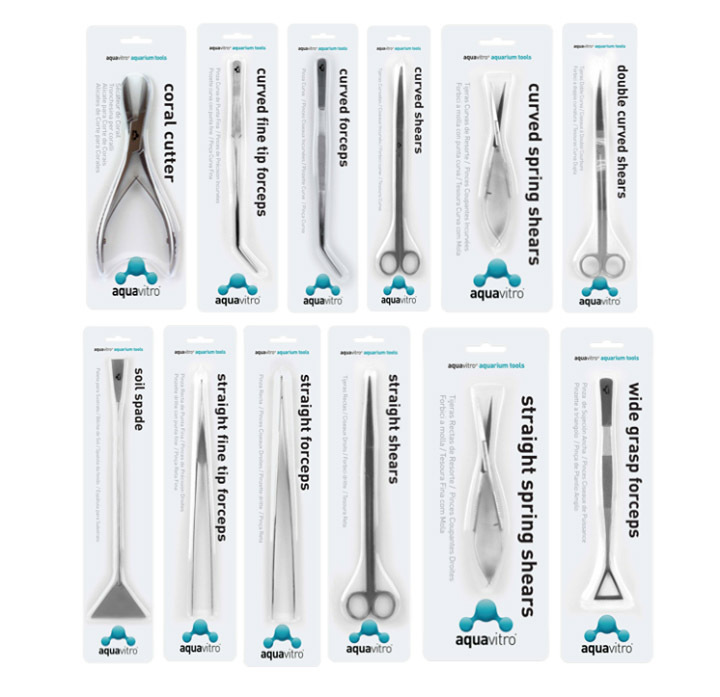 There are twelve different aquavitro® tools that consist of different types of forceps and shears, a soil spade, and a coral cutter. This range of tools will make excellent options for aquascaping planted aquariums and terrariums, or for trimming corals or marine algae in a reef environment. Each tool is individually packaged and like all aquavitro® products, these premium-quality tools are sold exclusively in independent retail aquarium stores.